This craft is an outboard powered version of my well tested T11 design with accommodations and other custom modifications to suit client's requirements. Accommodations are 2 double berth cabins forward, one compact doublecabin aft to starboard with toilet. Port side hull has a generous ensuite aft under galley. Spacious saloon and galley area with fold down table when extra sleeping arrangements are required. 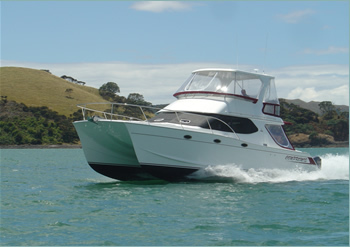 Flybridge has a hardtop and zip-up plastic clears all round, and from the aft end steering station the skipper has good forwards and aft visibility. Cockpit has uncluttered open area with easy access to the large boarding platform on the extended bridgedeck between the motors.